A negative month for my net worth, with global share markets taking a battering as the reality of the slow-down in the Chinese economy hit their stock market and then the rest of the world followed suit. This devalued my geared stock portfolio and retired savings considerably, although the overall impact was slightly mitigated by the continued rise in the estimated valuation of our Sydney real estate. The local council is still deciding on the rezoning of the area surrounding the new hospital site (which includes our home), so for the moment I'm continuing to use an estimated valuation based on the average sales data for the entire suburb. The overall monthly decline in my net worth was -$57,738. Not a particularly cheerful amount considering it is about the same as my annual after-tax 'tax home' pay! 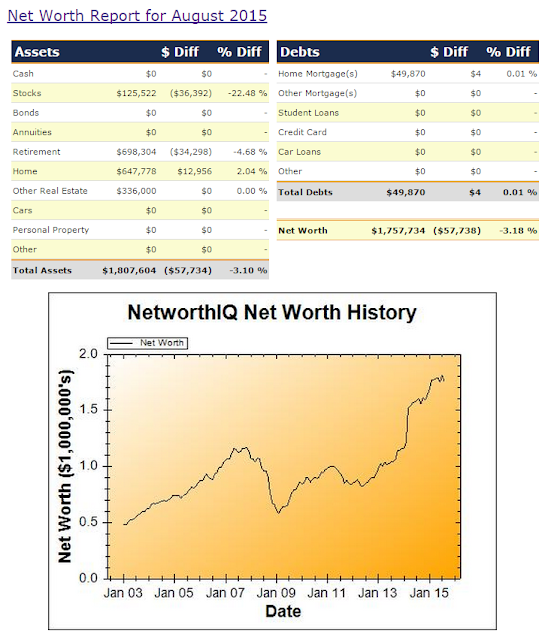 So far 2015 has seen very little change in my net worth, although the monthly fluctuations have been 'interesting' to say the least.